Older: The Olympics of Control — 2014 or 1984? Newer: Will Russia’s Putin Try To Split Crimea from Ukraine? In Sochi today, the most carefully watched page is not the Olympic medals count. It is the weather forecast. Down here on the Black Sea coast, daytime highs are nudging 20C. People are peeling off jackets and putting on sunglasses. One can only wonder why Russia chose to host the Winter Olympics in a city with palm trees and the world’s northernmost tea plantations. Sochi is a two-hour flight — or 1,360 kilometers — due south of the snows of Moscow. Weather history shows Sochi to be the warmest Winter Olympics host city since the games started in 1924. As in balmy Vancouver in 2010, all events on the seacoast are enclosed in temperature controlled covered skating rinks. The power comes from a newly gas-fired generator built by Gazprom. 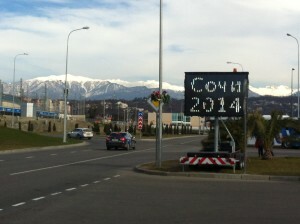 Russia’s biggest company has pride of place in Sochi’s Olympic Park. At one end, are two brightly painted generator smokestacks standing like red and white peppermint candy sticks. At the other end, is Russia’s version of the Olympic torch, a fat, yellow flame roaring through the night like a flare from a Siberian oil field. But skating rinks only host of five of the 15 Winter Olympic sports. The real problem is up in the mountains, where the other 10 sports take place, including downhill skiing, cross country skiing, ski jump, and biathlon. At Krasnaya Polana, the hub for the mountain events, nighttime temperatures are not forecast to drop back below freezing until Tuesday. On the plus side, no rain is forecast for the mountains. If humidity is low, it is possible to make snow in temperatures as high as 3C above zero. For now, experts bet that there will be enough snow pack in the mountains to get through the last mountain event, Men’s Cross Country on Sunday, Feb. 23. Whether at the skating events and the skiing events, it is fun to play the new Sochi game: spot what’s left of the old Soviet Union! Chances are, all but the most expert will end up with a big “nul,” or zero. If politics are theater, President Putin has set a very large, very expensive stage to showcase The New Russia. Eye-catching examples include: state of the art skating rinks built on an old collective farm, shiny new European gondolas strung through the Caucasus Mountains, and bridges and tunnels of the new electric train that climbs up from the seacoast. But train your eyes on the details. All the police officers wear uniforms that look as if they were issued last week. There is not a dented or dirty police car in sight. Also brand new is the ‘street furniture – highway guardrails and digital traffic lights. The bristle brush truck that scours dirt of streets looks as if it rolled off a German assembly line last week. Ditto for the sleek (Italian?) ice grooming machines. In places where Soviet Sochi could not be renovated in time, views of old building have been daintily blocked by boosterish billboards. Construction dirt has been spray painted green. Of course, the easy shot would be to call Putin’s Olympics the Potemkin Olympics. The phrase started with villages that Gregory Potemkin, a military leader, allegedly built along the Dnieper River in 1787 to fool Empress Catherine II (the Great) and the ambassadors of her military allies as she floated down river to inspect “New Russia” (now Ukraine). But in the 2014 Olympics, Putin’s strategy is more complex. On one hand, he is showing his “New Russia” (yet again) to the world. 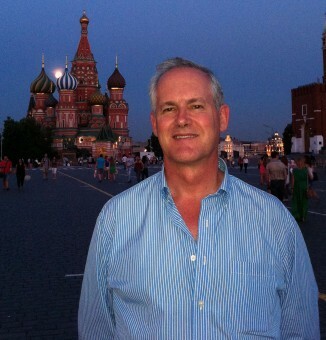 Who cares if an estimated 85 percent of Olympic visitors to Sochi are Russians? The real audience is the worldwide television audience of an estimated 1 billion. They are watching snowboarders performing acrobatic feats in Russian mountains, fireworks exploding over Russian stadiums, bobsledders rocketing down Russian ice tracks, and figure skaters performing dreamy ensembles in Russian skating rinks. And for Russians, the president’s goal is to inspire. Here is the New Russia, a can do country without screw-ups. Russia’s flag waving patriotic State TV is focusing on Russian successes and heroes – not much different than the core coverage by NBC, the American rights holder. Will images prevail over words? Russian respondents to a public opinion poll said they thought the chance to steal from the public was a more important motivation for officials to host the games than promoting the nation. 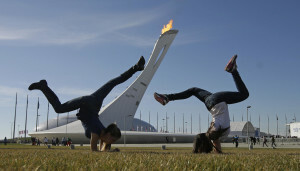 Time will tell what will be the legacy of the Putin Olympics. Instead of tearing apart pristine mountain valleys, as happened in the Caucasus, to create new Olympic game sites, why not re-use those that have already been built? That’s what happened in 1976 when Innsbruck, Austria, replaced Denver after Colorado voters rejected the Games, partly because of concern over what the construction would do to the mountain environment. Writing Monday, March 14, 2014.